Tragedies have a way of temporarily opening up windows on worlds we never knew, giving us a peek into how people we never thought of live and die. If we are lucky we will remember a face or a story, or the color of the sky or a smell that triggers good or bad. And sometimes it is the most seemingly banal detail that can set an event into perspective. Everest has been my teacher this year. We all know Everest, The myth. The mountain. If you live in Kathmandu, you are never allowed to forget. It is on many of my son’s t-shirts, it is the “Top of the World” coffee shop where fellow school mothers come for the wi-fi and a catch-up, it is there at “Le Sherpa” restaurant or at the “Sherpa Adventure Gear” store. It follows you in the fish-eye photo prints that line the streets of Thamel and the ubiquitous highly imaginative oil on canvas paintings that have a tiny yak crossing a rope bridge in the shadow of the world’s highest mountain. 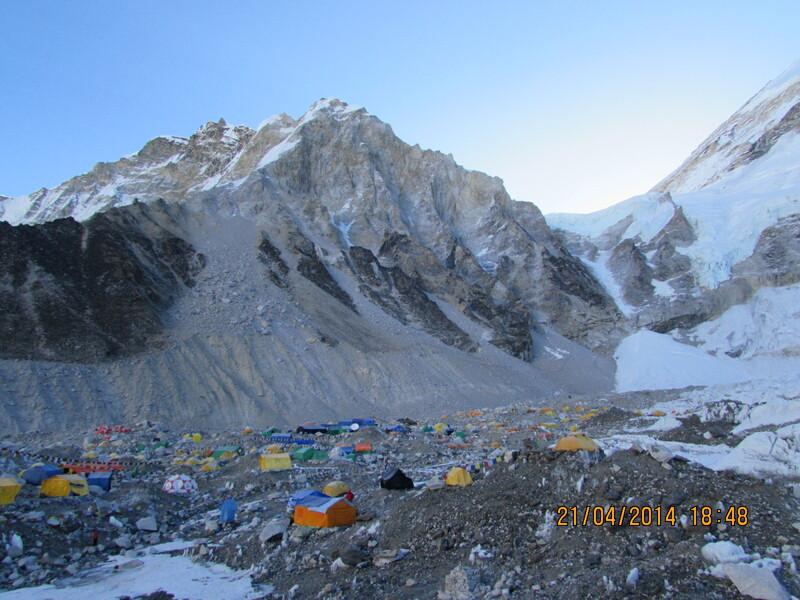 The Sherpas call the mountain Sagarmatha and this year they believe the goddess that lives there is angry. An ice Avalanche on April 18 on Mt. Everest killed 16 Nepalese high altitude climbers, most of them Sherpas, made international news for more than a week and opened a window on the dangerous work conditions, low pay, miserly injury insurance and death benefits of the Nepalese who make it possible for all the foreign climbers to get up the mountains. Within days, as tension mounted at Everest Base Camp (EBC) between sherpas, the climbing season on Everest ended before it really began. Though the disappointment of foreign climbers was widely read on blogs, very little was heard from the vast majority of Sherpas up on the mountain. My assignment for National Geographic was to find survivors of the avalanche in Kathmandu and tell their story. As a story goes, it was straight forward reporting. I tracked down two survivors in two hospitals. 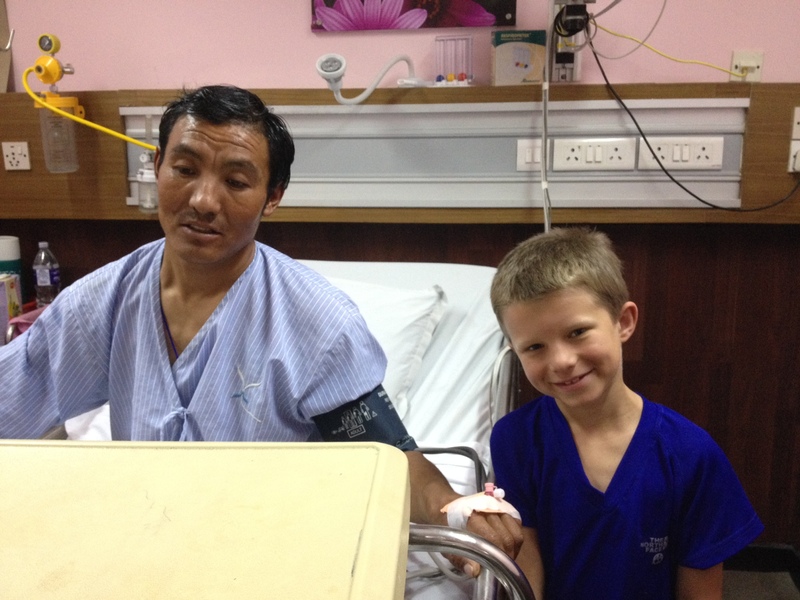 I had no child-care that day so my nine-year-old followed me into the ICU and sat next to Kaji Sherpa, at one point holding his hand and asking his own questions. I did phone interviews later at home with other Sherpas in town and international expeditions owners. I went to the expeditions website and read climber blogs. Neither Kaji Sherpa nor Ang Kami Sherpa had a formal education. But this job, as one of the luggers of heavy gear up to Camp 1 and 2, was the only option in their desperately poor villages to finance an education for their children and a better future for the extended family. On Everest, Sherpas work as guides that assist the climbers to summit but the majority set the ropes, lay the ladders across the dangerous crevasses of the Khumbu Icefall, lug up tents, cooking gas, oxygen, food even the toilets for the clients. Then at the end of the season, they bring everything back down including in some cases the client’s excrement. One climbing company advertises that it provides two Sherpas per climber to summit the mountain. When I asked a Sherpa friend why two were needed, he explained that one was there to push and the other to pull and if needed to carry extra oxygen. While foreign climbers who summit write books and go on talking circuits, little is known about the much larger number of Sherpas who go to the top over and over again. There are Sherpas that have summited Everest ten times or more, families where four and five brothers have all been to the top, others where three generations have gone all the way up. rarified world of climbers came in snippets of life through posted pictures and diary-like entries. 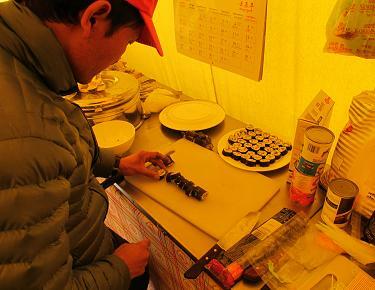 On expedition websites, I learned that a foreign climber enjoys carpeted toilets, hot showers, movies, happy hours and for some even sushi appetizers at EBC. dangerous airport.’ Then for several days, bad weather stopped the 19-seater flights, duffel bags backed up stacked high against the walls and in any available space. The departure area looked more like Heathrow during Easter weekend than a single room on a village hilltop. Usually there are only a couple of flights a day that land and take-off before the winds pick up mid-morning. 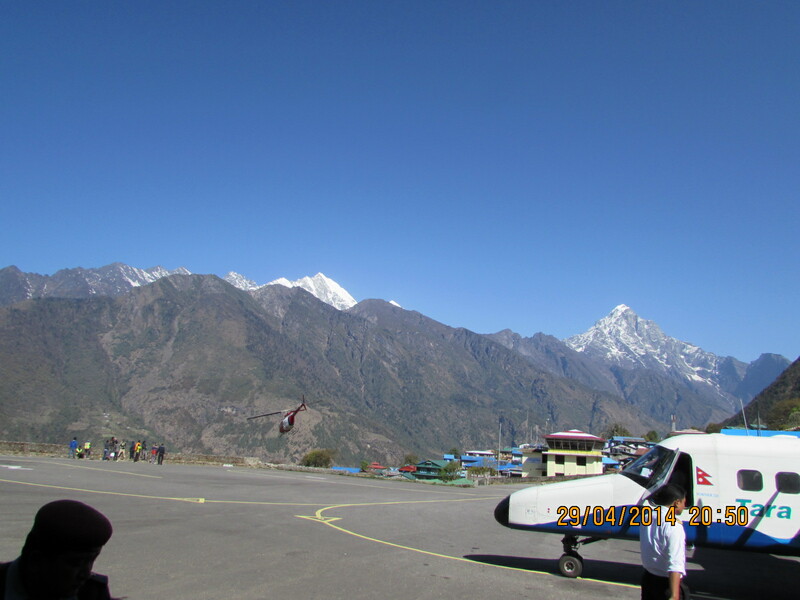 Yesterday, four Nepalese airlines scheduled 18 flights to Lukla. Some agencies chartered. 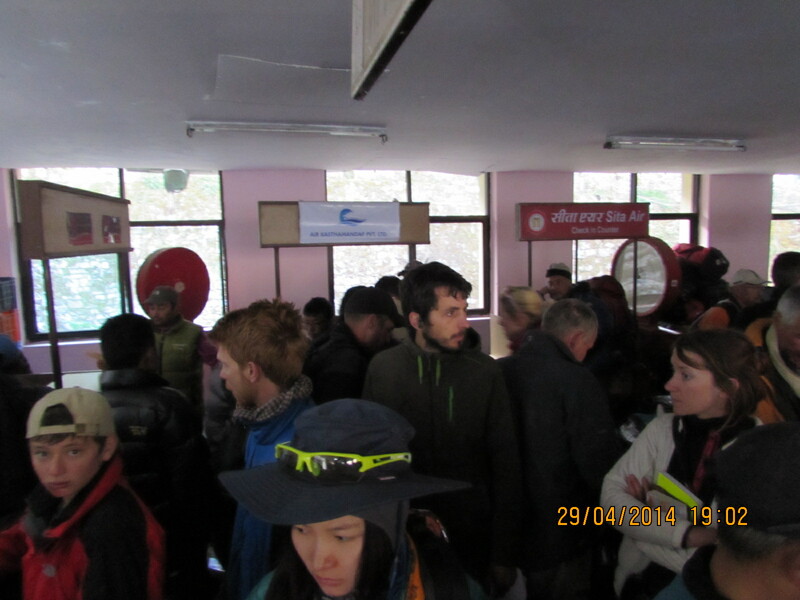 Though there were many Sherpas trying to get to Kathmandu as well, foreign climbers were given priority. 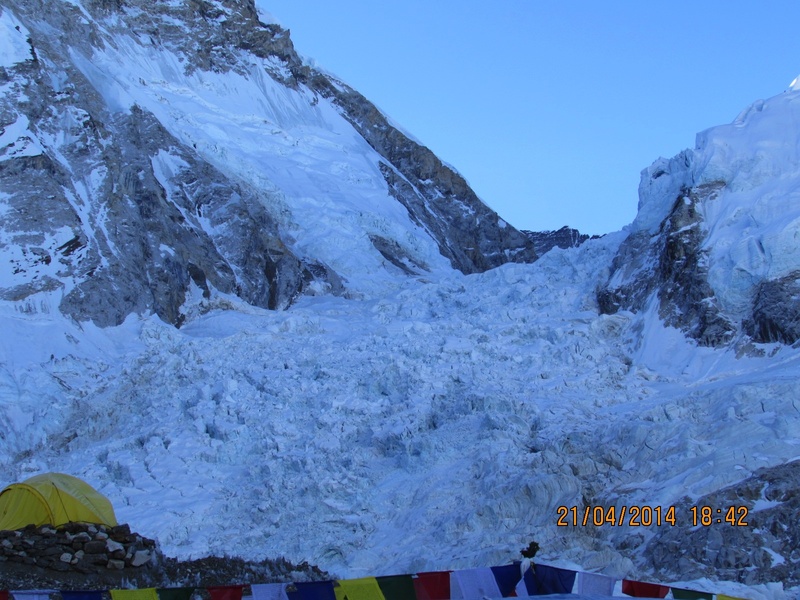 While their clients were heading to hotels in Kathmandu, eight international teams were figuring out how to rescue tons of equipment that had been pre-positioned in Camp 1 and Camp 2 above the Khumbu Icefall that was now deemed impassable. Alpine Ascents had in addition to regular gear, the added tonnage for Discovery Channel’s planned “Live” jump off of Everest. As non-emergency evacuation helicopter flights are not allowed above EBC, they had to get a special government permit to charter a B3 helicopter for a total of 20 flights that inserted team Sherpas to pack, repack and move the gear. No doubt an expensive venture for an already hurting industry. This week at a condolence ceremony in Kathmandu for the 16 dead, their families asked for better death and injury benefits. Kaji Sherpa hopes to be able to make the trip home to his village in Solu Khumbu soon and to see his wife and three children. He never wants to climb Everest again. Nowadays, the hi-end Yak&Yeti hotel is home to many of the teams. 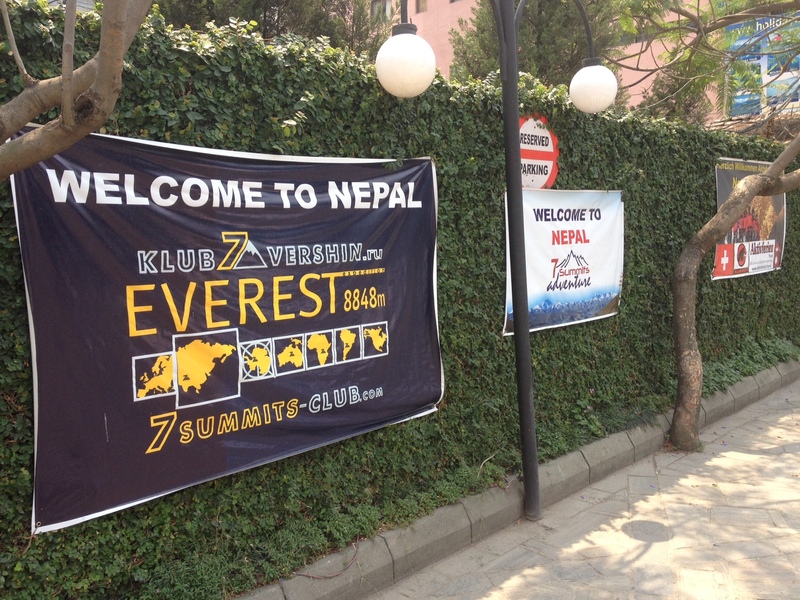 Banners welcoming Everest expeditions still line the brick walls in the parking lot. And the duffel bags from the Lukla airport are heaped in matching pyramids in the elegant lobby. There is talk of book deals from climbers and guides. But sadly none of them are Sherpas. This entry was posted in avalanche, Base camp, beauty, Everest, family, high altitude mountain climbers, international community, Kathmandu, Khumbu Icefall, mountain climbing, mountain tourism, Nepal, Sherpas, south asia, trekking and tagged avalanche, Donatella Lorch, everest, Kathmandu, khumbu icefall, lukla, mountain guides, Nepal, Nepal news, sherpas, south asia on May 2, 2014 by Donatella Lorch. Just drop a line when you are in town.